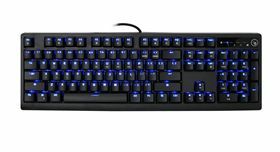 Kaliber Gaming's MECHLITE Mechanical Gaming Keyboard combines the exceptional feel and response of mechanical key switches with the must-have features gamers demand most. 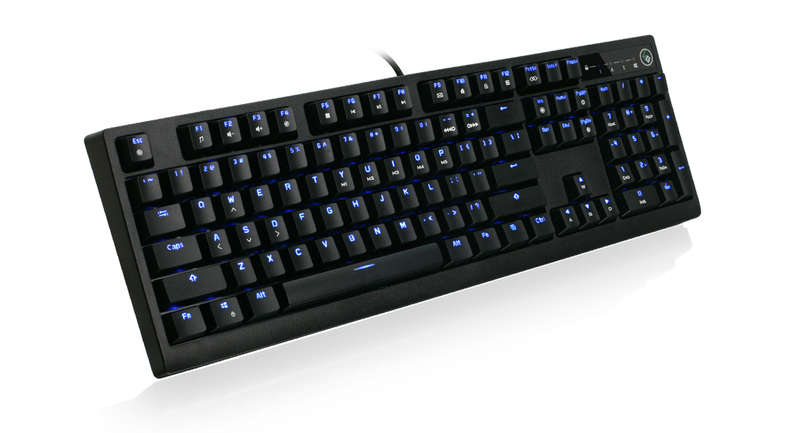 The MECHLITE is first and foremost a professional level keyboard, with an entirely mechanical design that was previously out of reach for most players. Even with the high cost of mechanical key switches, Kaliber Gaming has still managed to add LED backlight with adjustable brightness and a host of other features for a price that won't break the bank. The MECHLITE is available with your choice of blue, brown or red type mechanical switches so you can choose the keyboard feel that best fits with your play style and typing preference. Blue switches (GKB710L) provide a slightly resistive tactile feel with a bump-like actuation point that makes an audible click when pressed, giving gamers that assurance of positive engagement. 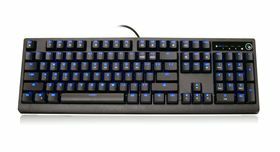 Brown switches (GKB710L-BN) are quieter (less-clicky) and require slightly less actuation force than Blue switches for a lighter overall feel. Red switches (GKB710L-RD) have no actuation click, making them even quieter than Brown switches and feature a linear design that provides the same smooth, solid feel throughout the full travel of the keystroke. Unlike dome or membrane switches, mechanical switches do not need to be fully depressed for proper registration, allowing users to game faster and with less hand fatigue than with traditional keyboards. 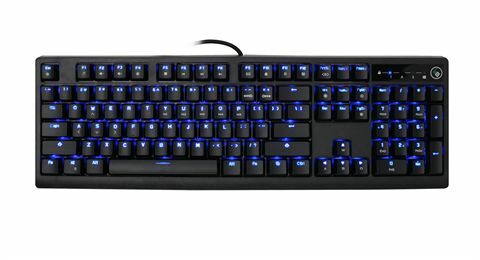 The MECHLITE Gaming Keyboard offers a choice of multiple LED lighting patterns that act as a moving light show, perfect for when it's time to add a little 'cool factor' to your gaming experience. 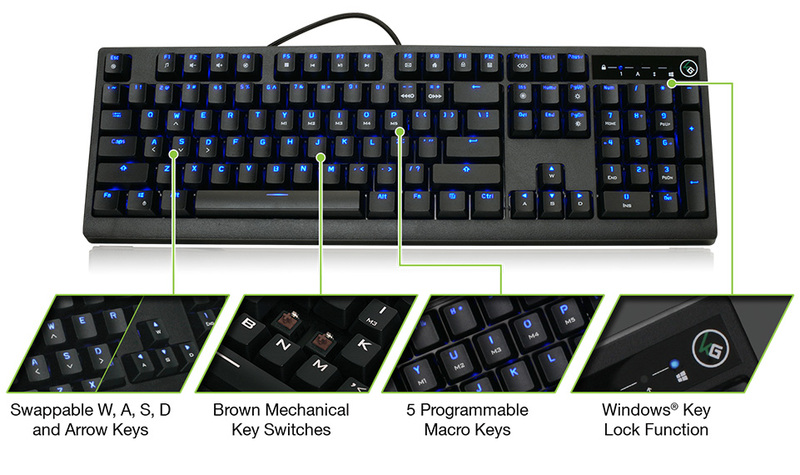 The MECHLITE has a Windows key lock function to prevent accidentally entering menus while gaming, and an All-Key lock that prevents unwanted keystrokes when you have to make a run to the fridge. Left-handed gamers can swap the W, A, S, D and arrow key functions, so both hands are in an optimal gaming position. 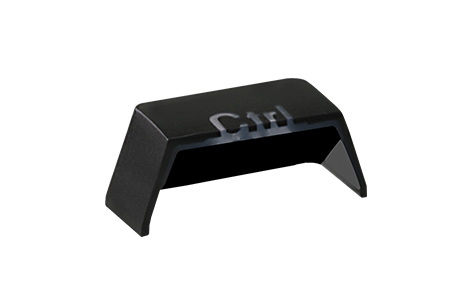 The heavy weighted base of the keyboard also increases stability while gaming, to prevent slippage. 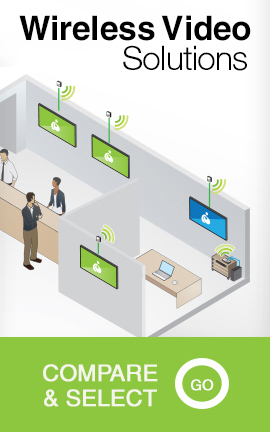 Use MECHLITE's five programmable buttons to execute a series of keystrokes with only a single press. These are great in-game tools for creating shortcuts for frequent commands such as casting spells, but they are also useful for simplifying your life outside of gaming. Use programmable buttons for simple text shortcuts like entering passwords or email addresses, accessing special menus and executing multi-key commands when using powerful programs like Photoshop and Solidworks. 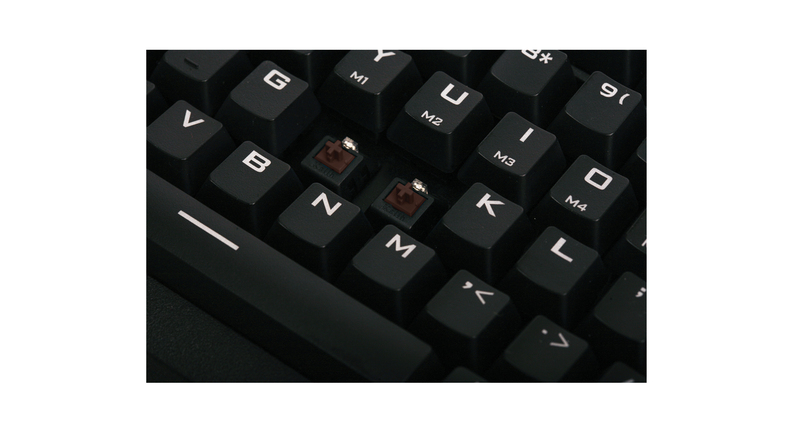 The MECHLITE features a complete Anti-Ghosting design which is more accurately referred to as full N-Key Rollover (NKRO) and ensures that every keystroke in every key combination will be registered. 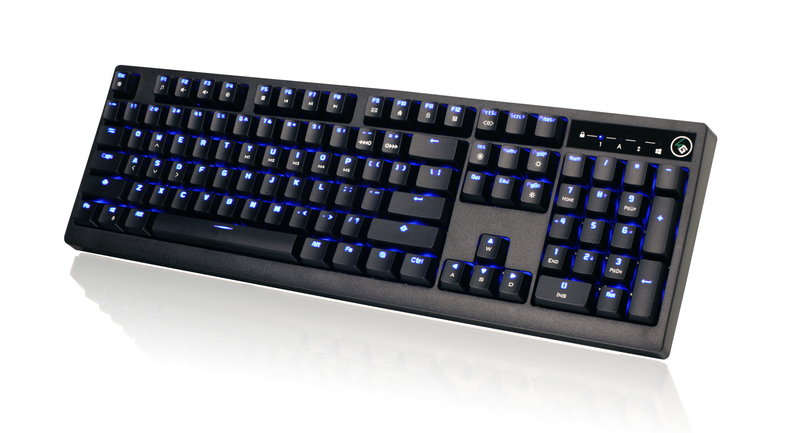 MECHLITE helps you play with confidence knowing your keyboard won't hold you back! For 2018 MECHLITE has been upgraded with double injected keycaps, which will last the life of the keyboard without wearing off. The double injection process means the characters on the face of each key are not printed onto the keycap, but actually, injection molded as part of the key for longevity. The keycap color material is then injected around the character to create a keycap that never wears out. Are you a console gamer? 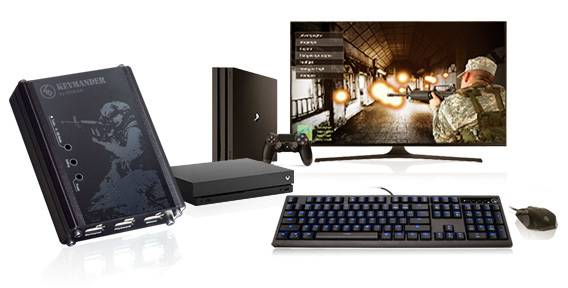 Did you know that instead of using joystick controllers you can use a keyboard and mouse with most games by connecting through a mouse and keyboard adapter like IOGEAR's Keymander? Utilizing the MECHLITE with Keymander offers a gaming experience on your PS4, PS3, Xbox One or Xbox 360 that is unmatchable with a standard controller. Precision aiming, faster targeting and easier movement while shooting are just a few of the reasons computer gamers have always had an advantage over console gamers. Experience the power with Keymander! Anti-Ghosting keys with full rollover so you never miss a keystroke!